There are two types of people: the Givers and the Takers. The Takers eat well, but the Givers sleep well. If Danny Thomas was correct, St. Mary Medical Center benefactor Gardner Roth slept very well indeed. If anything, the late William Gardner Roth was a giver. He not only gave financially to St. Marybut also gave to a number of other non-profit organizations, educational institutions and to many friends and family members as well. He was a very generous man. Although Gardner gave lavishly, he lived very modestly. Born in Minnesota, Gardner and his beloved wife Katherine moved to Long Beach in the late 1940's and devoted their careers to teaching young people, Gardner music and Katherine business. Former Foundation Board Chair, Bob Fronke, recalled that Gardner taught his son music in high school, so well in fact that he has gone on to a very successful international musical career. Both Gardner and Katherine were very active in their church and Katherine was a long-time member of the St. Mary Guild. After Katherine's death, Gardner moved into Bixby Towers where he had many friends and enjoyed listening to music, watching sports on television and monitoring his investments. Among his donations was a new van to Bixby Towers that provided much-needed transportation for the residents. When Gardner was an undergraduate at the University of Minnesota, he was hired each summer by The Great Northern Railway to put together a band of fellow music students to entertain guests at the Railway's lodge in Glacier National Park. In appreciation for the scholarship he received from the University, he established a scholarship endowment fund for needy music students. The Katherine and W. Gardner Roth Endowment, through contributions made during his life and a bequest in his trust, now exceeds $1 million and provides tuition grants for a number of students each year. Likewise, the Roth'sestablished an endowed scholarship fund at Katherine's alma mater, the University of South Dakota. This fund provides scholarship grants for needy students in the College of Business at USD and also has a balance exceeding $1M. Gardner's gifts to St. Mary have been numerous and generous. He gave $100,000 to St. Mary's 75th Anniversary Campaign in honor of Katherine who passed away in 1998. She was the love of his life and they had been married for 55 years. In addition, he gave several gifts of $10,000 in recent years. He also donated 120 acres of cultivated farm land in northeastern South Dakota to St. Mary that was recently sold to the long-time tenant farmers for $220,000. This was land that was in Katherine's family for many years and Gardner, being the wonderful person he was, insisted that the tenants be given the first right to purchase the land, which they did. Gardner's most significant donation to St. Mary came through a $700,000 bequest in his living trust. This, coupled with their lifetime giving, made their total giving to St. Mary more than $1M, making Gardner and Katherine two of the major benefactors in the storied philanthropic history of St. Mary Medical Center. Although Gardner made these very generous charitable gifts, he also left his two surviving sisters, several nephews and nieces and many friends' significant bequests. He was very appreciative of the great counsel he received from his estate planning attorney, Bob Waestman, and Garry Baker, his Farmers and his Merchant Bank trust officer. 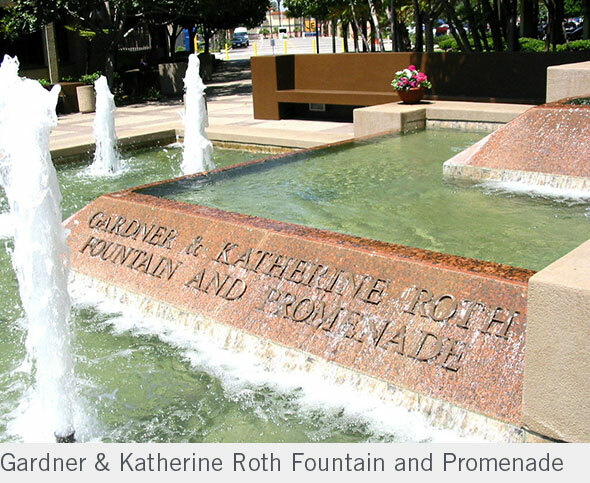 In appreciation for their generosity, St. Mary Medical Center Foundation named the beautiful Promenade Water Fountain after Gardner and Katherine Roth. Gardner loved to show off "their" water fountain whenever friends and visiting relatives came to town.